The CS-Cart Layouts for devices add-on is a super useful extension that allows you to show different layouts on desktop, mobile, and tablet devices. Traffic from mobile devices is now nearly 50 percent of overall online retail traffic*. 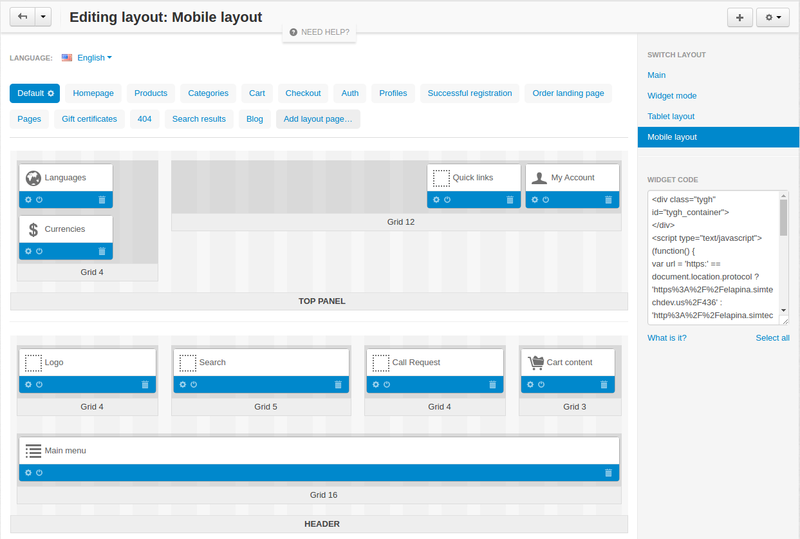 Take full advantage of mobile traffic with the Mobile Layouts add-on. The Mobile Layouts add-on is a complete and easy solution to have a website with custom layouts for different types of devices. 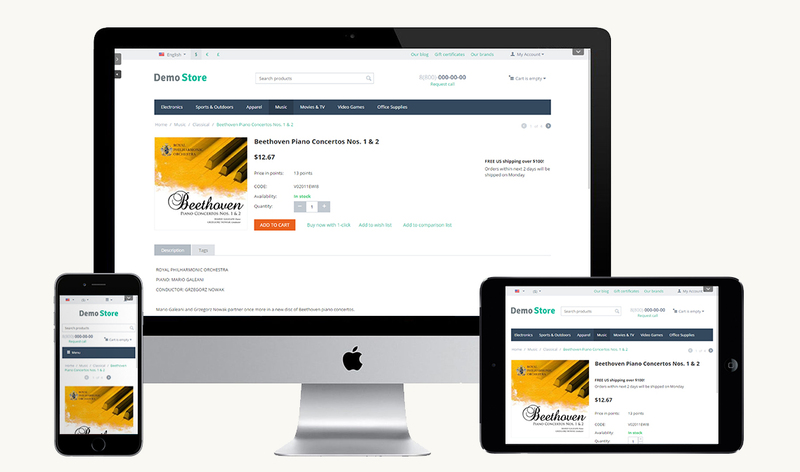 Make your web store look beautiful and responsive on desktop, mobile, and tablet devices in a snap. *According to the latest data from IBM Digital Analytics Benchmark. — Select a desired layout to display on different versions. Create several layouts for tablets, desktops and mobile devices. — Hide useless blocks from the mobile version. Your customers do not need extra elements or blocks, as they distract customers from making purchases. For example, you can disable Similar products”, “Recently viewed” blocks for mobile devices. — Make the navigation on tablets and mobile devices easier. Easily change the blocks order to increase the conversion and improve the experience of customers who prefer to buy from mobile phones and tablets. — Get rid of extra links in the footer in the mobile version. It’s a sign of a good taste when the footer fits the format of a device. Hide or put extra links away for tablets and mobile devices except the main links — contacts, social networks, and “View cart” for example. Once you have installed the add-on, you can create layouts which you want to display for different devices. 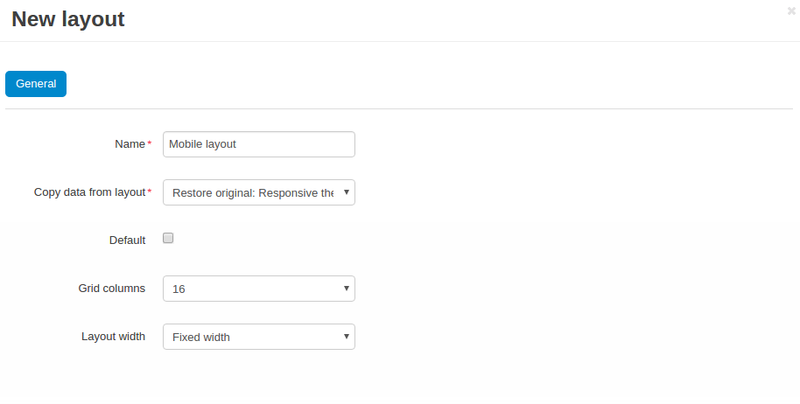 To create a new layout, go to Design -> Layouts, click the + button in the top right. Set up the layout up to your needs by changing blocks position, hiding blocks or adding new elements. You can set up custom pages on your site, used only for mobile devices, tablets or desktops. Everything depends on the type of your ecommerce niche, your customers preferences according to the web store analytics. Note that if “None” is selected, the default layout will be used. The Mobile Layouts add-on will help you increase conversion, adapt the design for different devices and make your customers more happy. The add-on is compatible with CS-Cart and Multi-Vendor 4.3.0 and above. [~] The name of the Layouts for devices add-on has been changed to Mobile Layouts. [!] Add-on's settings did not open in multivendor stores. Fixed. [!] When the admin created an additional layout and tried to change a tab, the layout was switched to main. Fixed. [+] The add-on became compatible with CS-Cart Multivendor 4.3.6.